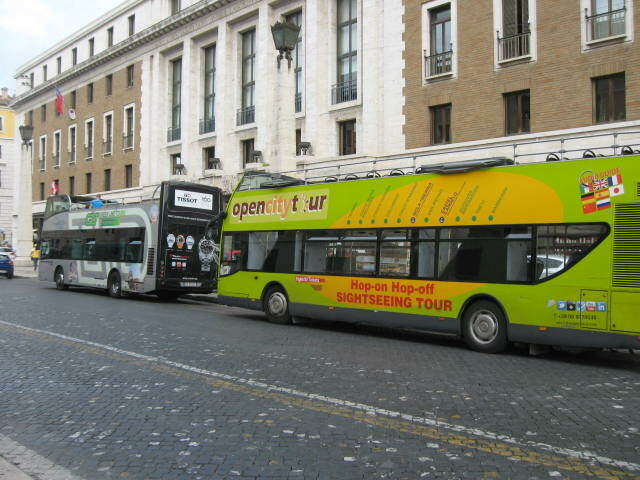 Open top sightseeing Rome - Hop on hop off bus Rome Tour buses in Rome. A fabulous way to see this incredible city for the first time! 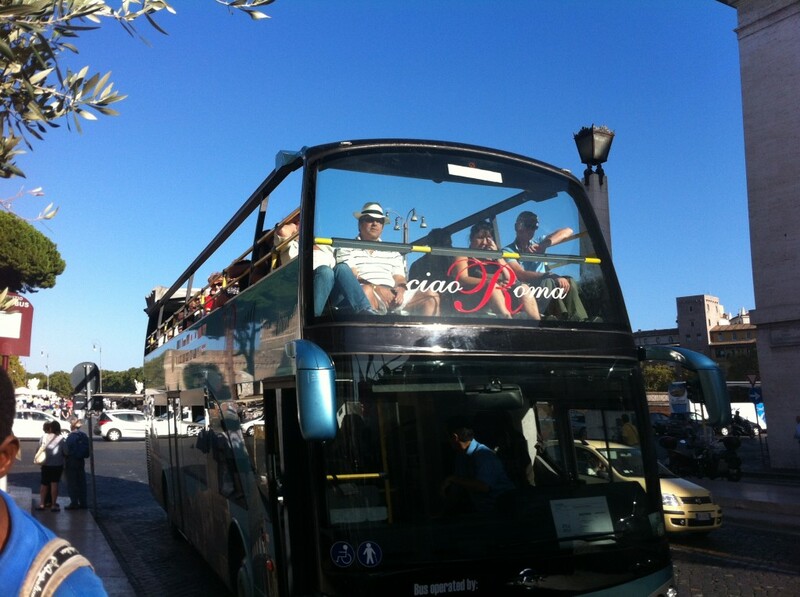 In Rome we have 7 open roof - hop on hop off - tour bus companies. Which one to choose is not always easy to say, it depends mostly on your interests and how much time you have available. For example the Roma Christina bus tour is more specialized with pilgrims; Roma Cristiana is part of the Opera Romana Pellegrinaggi which is overseen by the Vatican. They also offer deals which include public transportation tickets. Generally, buses can’t get into small roads, especially in the old city center. This is why you always have to consider that you will walk a lot even though you’re talking the hop on hop off bus! 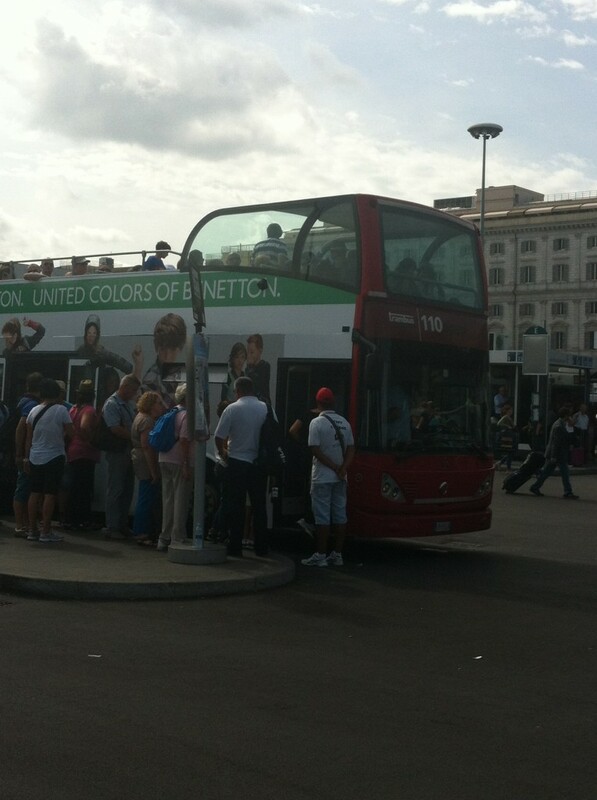 Every bus tour will tell you how often it runs but it is always subject to the traffic in Rome. During the summer months it gets very hot and the double decker buses do not have sun protection on the roof, neither do the bus stops where you have to wait, so it is always a good idea to have sun screen with you. Having a water bottle isn't a bad idea either but near most stops you'll be able to find food and snacks stands! If you are traveling with children then it’s worth having a closer look at the kid’s prices and up to what age you get discounts. 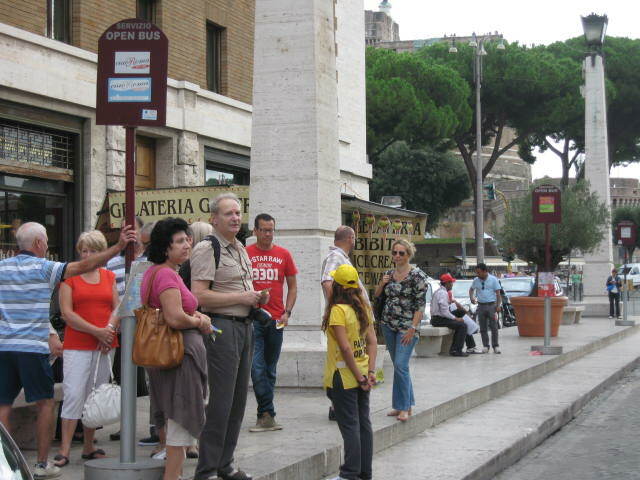 The Roma Cristiana Open bus tour gives you the best deal considering that kids under 10 go for free. Take some time before you start to hop-on and off, write down your needs on a piece of paper and start comparing one by one. Check each website separately because many open hop on-hop off bus tours offer special deals and discounts, especially during summer! When you’re around Termini train station, many ticket vendors will stop you so it is good if you know what you are looking for in advance so you know if you are getting the bus tour you want! Please ask before: if the tickets you are getting are valid for calendar days or from the first validation! 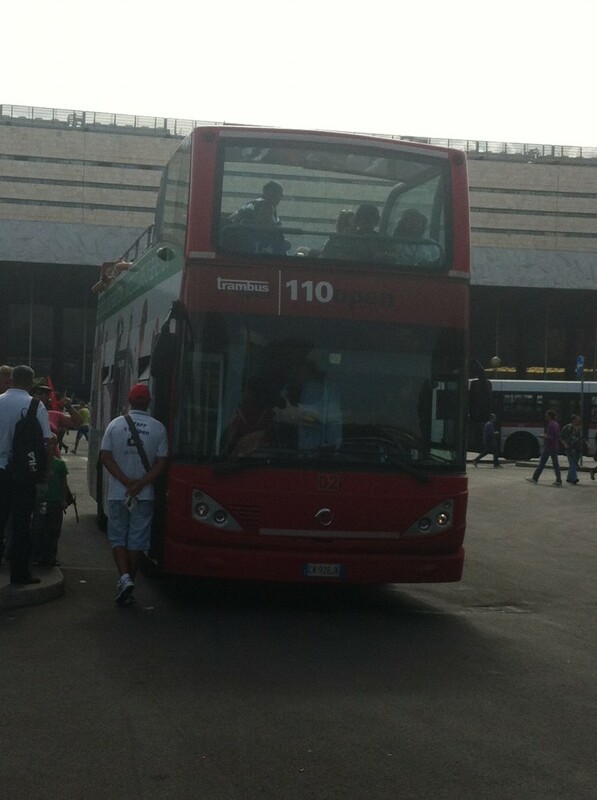 A bus company I really like is the City Sightseeing Rome bus tours. Rome is a very special city and has many attractions. Line A from City Sightseeing Rome has 8 stops, which covers a lot of the city and the whole tour lasts about 1, 5 hours depending on traffic. 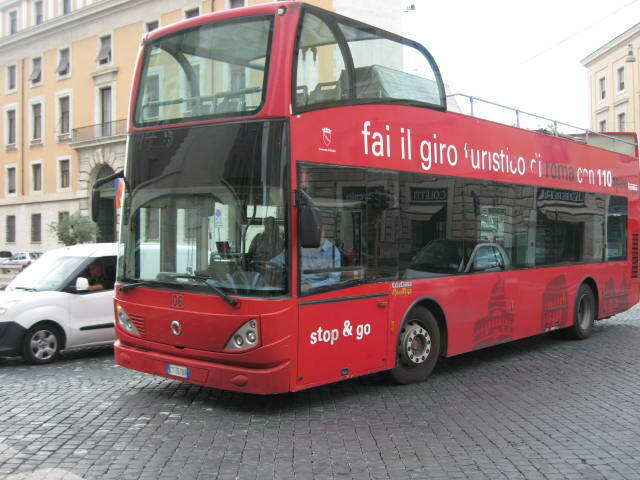 This special bus 110 Open bus tour of Rome for tourists departs every 10 minutes starting from 8.00AM – 8.00PM from Piazza del Cinquecento which is the square in front of Termini train Station. It's special because you can combine it with the Archeobus which takes you to the most important archaeological sites of Rome. A hostess on the bus offers tour guides in several languages! It takes you around the most famous sights in Rome. Check out the special private party tour they offer, breakfast or Happy Hour included! This special bus for tourists departs every 30 minutes starting from 9.00AM – 4.00PM from Piazza del Cinquecento which is the square in front of Termini train Station. It's special because you can combine it with the 110Open Bus Tour which will take you through the city center! A hostess on the bus offers tour guides in several languages! The Archeobus will take you to the most famous Roman archaeological sites along Via Appia and more! Rome is the heart of Christianity. For visitors which are targeting religious attractions, this tour is perfect then this tour goes strong on the Vatican. It also takes you out to San Giovanni in Laterano, the Baths of Caracalla and the Appian way. Roma Christiana Open Bus Tours is organized by the Vatican and has 2 routes; one called the St. Peter’s route with 12 stops which covers most of down town and the other one is called Saint Paul’s route with 8 stops and covers mainly religious sites. 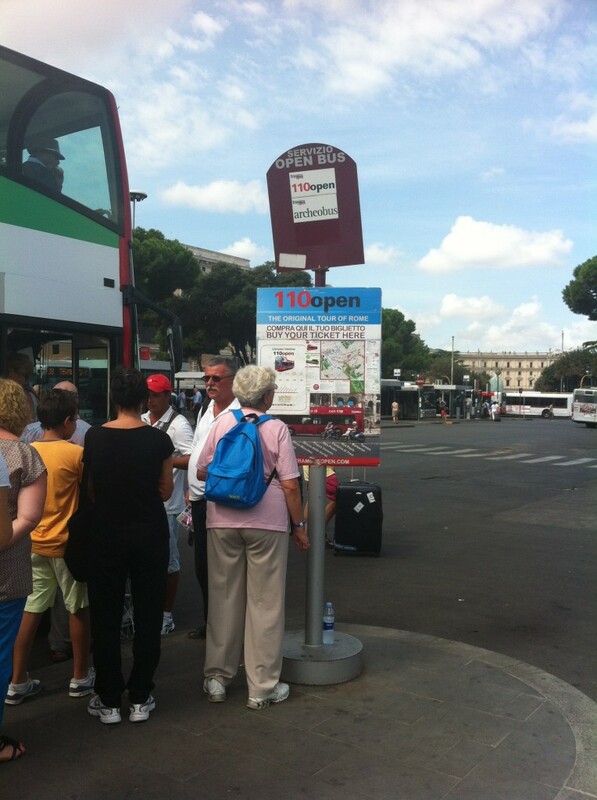 The Ciao Roma Tour bus offers a tour of 14 stops. Like all other buses this bus is a double decker with an open top, so the view for their visitors is perfect! The tour comes with a pre-recorded audio commentary so you should always know where you are. Disposable ear phones come along with it! The Open tour bus offers the hop-on hop-off service for their guests all year around! You are free get on and off as many times as you wish. This bus tour offers special deals when booking on line; you’ll save up to 10%! The ticket includes a smart guide, discount carnet and a shopping guide for the city. The Green line tour is actually a tour operator which offers more services like excursions and doesn’t limit itself to the bus service of a hop-on hop-off bus which they call the Panoramic Open Tour. The tours last about 2 hours, depending on traffic and tourists have the chance to cruise around the eternal city on an open double decker! Save 10% when booking on line! 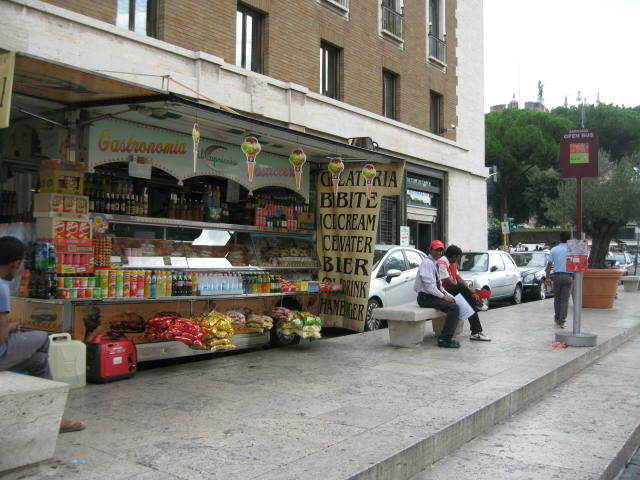 This entry was posted in Tours in Rome and tagged Hop on Hop off Tours Rome, Rome Bus Tours. Bookmark the permalink.